CNC machine were once only use in larger production shops with larger runs because of the expense built into the machine. Recently the machine have come done in price, and have become economically feasible for even small shops, and some are in the range of hobbyist. The CNC router machine cuts in three directions at once. The precision of the router's cutting relies on the design software, software that provides a two-fold advantage to the router operator. To begin with, the CAD software gives the operator of the CNC router machine the ability to create the design that will be cut into the solid plate. The CNC router machine cuts in three directions at once. The precision of the router’s cutting relies on the design software, software that provides a two-fold advantage to the router operator. To begin with, the CAD software gives the operator of the CNC router machine the ability to create the design that will be cut into the solid plate. After the operator creates the design, that same operator relies on the computer to send the proper operating instructions. This is the newer ventures I have started into. This is a router coming out of Kansas City, Mo., I would call this one the prototype, it is the first one built. But the man has kind of dropped the project again. Maybe in the future we will see it come back and be available. CNC routers are "computer numerical controlled" machines that take the fine work of measuring, sawing, wood carving, planing, drilling, cutting mortises and tenons, and even collecting dust out of the hands of the carpenter and put it into the processors, planers, drill bits, and other fiddly bits of the computer and router machine. What can be achieved in terms of project design, time savings, and labor savings with a CNC wood router is nothing short of stunning. Computer numerical control (CNC) is a computer "controller" that reads G-code and M-code commands and drives a machine tool by numerically interpolating the points along a cutting tool's tool-path and directing the servomechanisms that translate the data into movement. What exactly are these tools and what are they good for? In the past CNC tools were confined primarily to industrial use. These were usually large and enormously expensive machines. Although these machines still exist, so do also a new breed of smaller, less expensive machines that are much closer to being economically affordable. Owning a CNC router would have been unthinkable for a small woodworking shop just a few years ago. 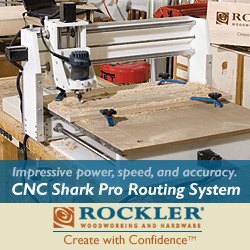 The high cost of these remarkable machines meant that CNC routers were out of reach for all but the largest operations, but recent cost reductions have meant that even do it yourself-ers can have the power and versatility of a wood router. A CNC wood router can be a great investment, especially if you want to produce high quality signage. With such a machine the user can input almost any design into the software program and produce intricate engravings, three dimensional effects, and even pictures of people or animals that are incredibly life like.